The unique extraction system featured in the PAL-2RC allows the light fitting to be removed from the pool with no tools. For complete order details on the PAL-2RC and PAL underwater light accessories available, click here. 2. Fit the PAL-2RCA concrete wall housing into place in the steel work using wire to secure the housing into position with the mounting lugs around the housing. Ensure the PAL-2RCA concrete wall housing is Level and Square with the pool wall and there is at least 170mm from the front of the concrete and the back of the housing to ensure the PAL-2RC light assembly can be glued in correctly when the concrete shell is complete. NOTE: There are 4 lines on the housing indicating the approximate position where the front of the concrete should finish allowing the light assembly to fit correctly. (4x Construction Lines shown below). 3. After blowing the wall and concrete is set, trim the pipe down to flush with the wall as shown below. 4. Before the pool finish is applied the PAL-2RC should be glued into the PAL-2RCA assembly using PVC glue to seal and locate the fitting into position. 5. With the fitting in position in the Concrete Wall the Pool Finish can be applied up to the front face of the fitting as shown on the assembly drawing. Note: The disposable Lens Cover fitted to the PAL-2RC will protect the fitting while the finish is being applied. 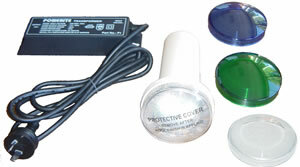 The protective lens cover is replaced by the normal lens cover supplied with the PAL-2RC when the pool is ready to be filled with water. 1. Remove the "Clip-On" Lens Cover on the PAL-2RC and twist the body in a anti-clockwise direction to retract the fitting from the housing. 4. When reassembling the PAL-2RC fitting ensure the "O" ring is sitting correctly and replace the lens, clamping ring and (6) six lens screws and ensure the screws are not overtightened.